Julius will next star in the iconic role of Max Bialystock in THE PRODUCERS for Manchester Royal Exchange. 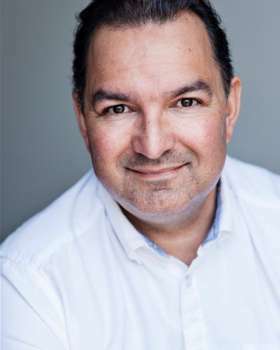 His extensive theatre credits include THE CHERRY ORCHARD (Bristol Old Vic/Manchester Royal Exchange), Baz Luhrmann's STRICTLY BALLROOM (West Yorkshire Playhouse & Toronto), MADE IN DAGENHAM (Adelphi Theatre), ETERNAL LOVE (Shakespeare's Globe / ETT / UK Tour), ANNE BOLEYN (Shakespeare's Globe / ETT), MACBETH (Shakespeare's Globe), OLIVER! (Theatre Royal Drury Lane), ARISTO (Chichester Festival Theatre). As part of the Royal Shakespeare Company’s HISTORIES ENSEMBLE 2006 - 2008 directed by Michael Boyd (Laurence Olivier Awards for Best Company Performance, Best Revival and Best Design 2009) HENRY IV PARTS 1 & 2 , HENRY V, HENRY VI PART 1, HENRY VI PART 2, HENRY VI PART 3, RICHARD III. Also for the RSC, GREAT EXPECTATIONS (RSC/Cheek By Jowl), DOG IN THE MANGER, TAMAR'S REVENGE, HOUSE OF DESIRES and PEDRO THE GREAT PRETENDER. Other theatre work includes THE WAX KING (LSW), AS YOU LIKE IT (BAC), THE IMPORTANCE OF BEING EARNEST (Insomniac Limited), TESS OF THE D'URBERVILLES (Greenwich Studio), THE TEMPEST (Edinburgh Festival), MEASURE FOR MEASURE (Rome), NOISES OFF (Gallery Productions), VERGIL and CAESAR (Oxford Playhouse), BOUNCERS (Burton Taylor Theatre), and RICHARD II at the Ludow festival directed by Steven Berkoff. Film credits include NOTES ON A SCANDAL, FULL CIRCLE and ENDGAME. Television includes THE CROWN (Season 1 & 2), THE TEN COMMANDMENTS, HOW WE USED TO LIVE: SPANISH ARMADA & HIGHLANDER. For BBC Radio 4, Wordsworth and Coleridge:The Lyrical Ballads, The Flea by John Donne, The Horse by Rana Dasgupta, and Van Gogh: The Letters.